My good friend Larry Clarkberg of Boxy Bikes in Ithaca NY was the person who got me hooked on ebikes. He sold me a crappy old Giant Twist after much haggling for $600 with a souped up 32v battery (the Twist shipped with a nearly useless 24v battery). I often thank him for completely destroying my pathetic excuse for a life and he will snark a little under his breath. Larry had a great idea, for Halloween he wanted to turn Press Bay Alley into Diagon Alley from the Harry Potter series. My good friend John Guttridge started Computer Gurus with me 15 years ago. He broke off and formed his own business “Brightworks” about 5 years ago. I send as many of my customers as I can to him and then I never see them again, because I am lazy and I hate to work. John owns Press Bay Alley & the old Ithaca Journal building and he and Darlynne Overbaugh started to organize a small event that they expected would draw 200-300 people. When the event was actually hosted between 8,000 & 15,000 people actually showed up, most of them in Harry Potter themed attire. Here is the story of how it was conceived straight from Larry’s fingers. In retrospect it’s a pretty amazing story. It’s a testament to Press Bay Alley’s creativity and Ithaca’s ability to rise to the occasion. It’s a story about the lighting strike of the Internet going viral. That lightning strike is completely unpredictable and a bit scary. But it’s also awesome and a great opportunity as we saw yesterday. How can other retail spaces similarly attract and harness an internet lightning strike like this? It’s hard to say, but one thing is certain: if a retail space is local, connected, and creative they can be ready to roll with it. Let the games begin. That looks safe to me. Diagon Alley from the Harry Potter movie series. The winner of the costume contest. Photo by Allison Usavage. It was personal for her. Here we were thinking of our event as just a bit of fun for our Ithacan friends and family, but Jolene saw it as “the defining story of a generation”. Her short article was almost giddy with excitement. This fanaticism is beyond my own understanding. Over and over again during our Wizarding Weekend I saw 20-somethings give Harry Potterdom an almost religious reverence. The facebook visitor count continued to rise by about 500 a day. I told people that our Wizarding Weekend was going to be the Woodstock of the millennial generation. By Thursday evening John wrote to us “I am mildly worried about how much space we will have considering how many people are coming (it is over 2700 now…) but think it will probably be great.” The next day he walked around his property and determined that at most 1500 people could stand on it at once. Clearly this event was going to extend beyond his own boundaries. He swung into action. 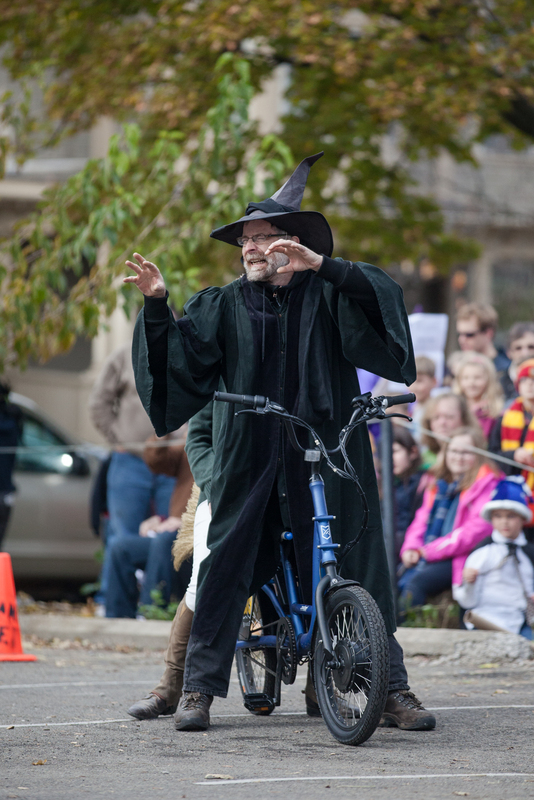 He contacted the Downtown Ithaca Alliance, the mayor, the food trucks, photographers, magicians, Convention & Visitors Bureau, the Cornell Raptors program, and many other Ithaca organizations who might be able to participate. John is good at making things happen. He has a lot of connections to the City and to other entrepreneurs. It was a joy to see him take this on with gusto. 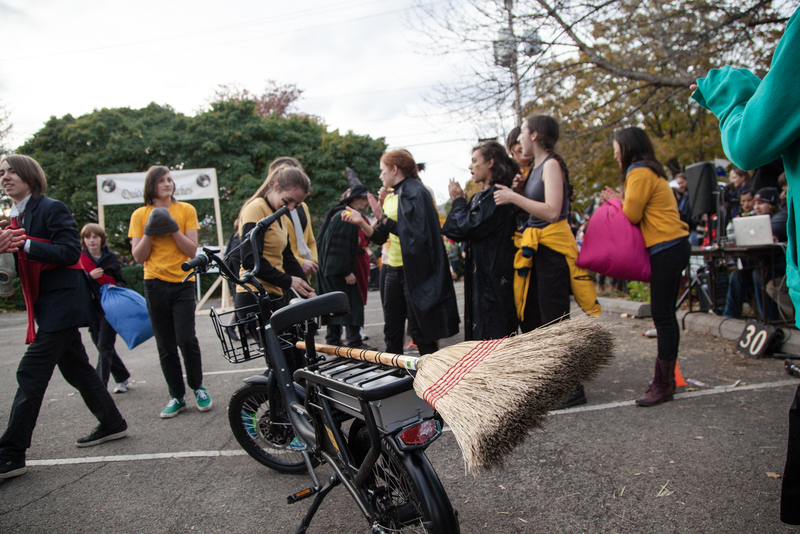 For my part I focussed on organizing the Cargo Bike Quidditch match. One of my best moves ever was to hire photographer Allison Usavage. 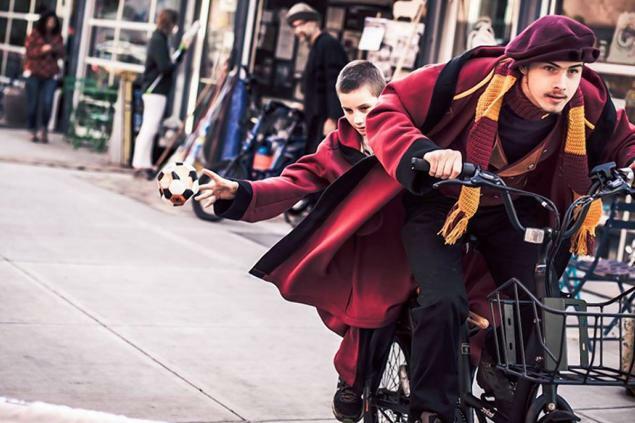 Her photos of my General Manager Gabe Gaydos and his brother Aidan biking up and down Press Bay Alley in full Quidditch garb fanned the flames of internet interest. 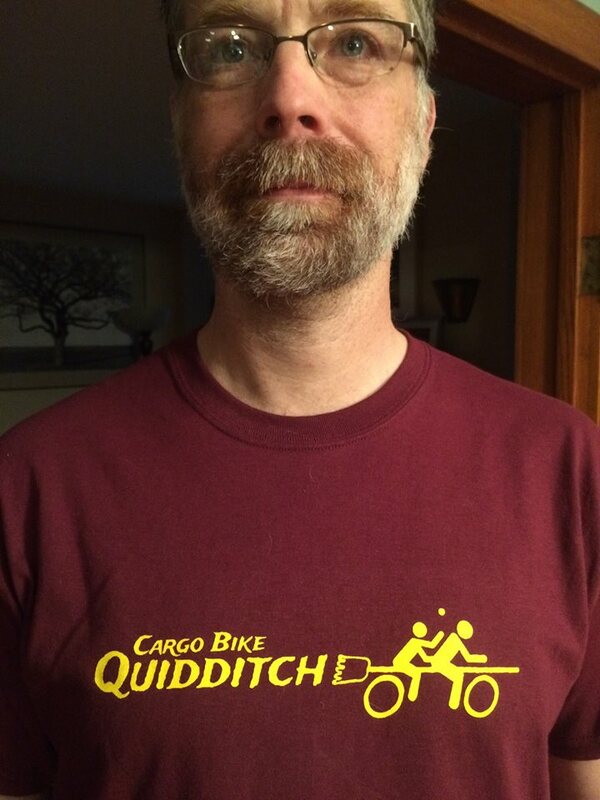 Within about four days I invented the game of Cargo Bike Quidditch, organized a homeschooler team and teams from each of the three main high schools in Ithaca, designed a logo, and had t-shirts printed. There is another important part to this story: Ithaca Generator. The importance of Press Bay Alley having a makerspace in its midst cannot be underestimated. In addition to giving us shopkeepers access to tools, the makerspace is the wild side of the Alley, keeping it real. Many readers may not even know what a makerspace is. It is an international movement of underground (literally underground in our case) community workshops. It is also a wellspring of innovation. Generator members kind of do their own thing. No one is in charge. You never really know what’s going to happen next but whatever it is, it’s invariably cool. Every time I passed through the space last week I saw more and more cool things coming together. My General Manager Gabe making some amazing signs for all the shops on the laser cutter. Alexy creating a wall of animated portraits. Jeremy setting up some lathes to do wand-making. Mark shouting spells at voice-recognition software on his computer. And when I passed through the makerspace on Friday morning I was greeted by an eight-foot long dragon head that a group of home-schoolers had just assembled out of chicken wire and paper mache the night before. This Wizarding Weekend event proves that Press Bay Alley is a special place that deserves to be held up as an example. I can’t see a mall doing what we did here. Mall employees don’t have incentive to do much beyond what they are told. Mall business don’t have connections to local farms and craftspeople, their allegiance is to a corporate headquarters beyond the horizon. Their marketing is in the margins of our facebook pages, not in the center.And the rest is history. 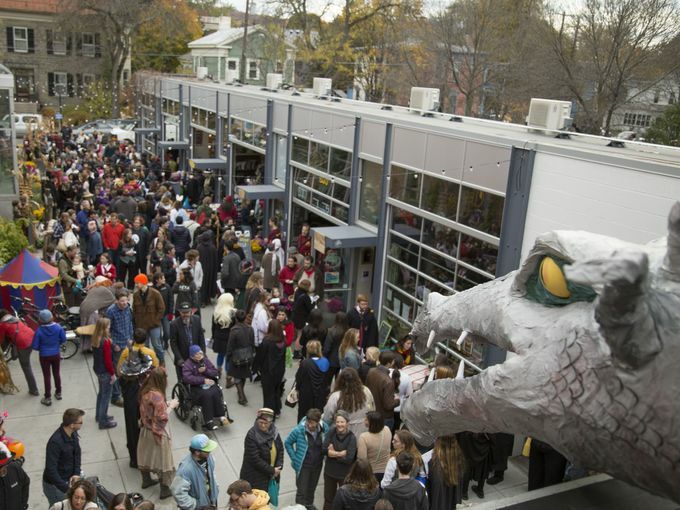 Between 8,000 and 15,000 people came to Ithaca yesterday and enjoyed our hard work and creativity. That’s a lot of people considering that the population of Ithaca is 30,000. 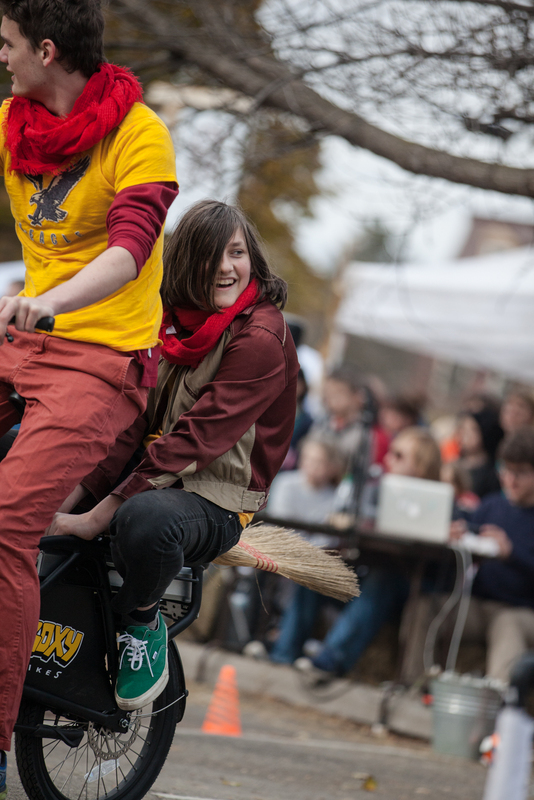 In just over a week we had put together an event that rivals other major Ithaca events. Thanks everyone and see you next year! My life hasn’t been the same since I met Larry. Buy an ebike, it will change your life too. For the better. 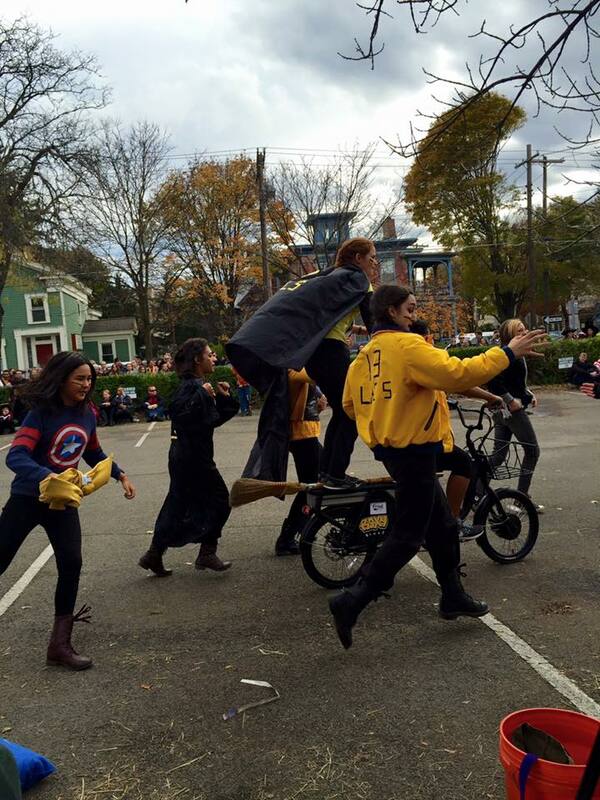 The Quidditch games were very well received, there is a video of it posted on the Ithaca Journal website here. I also had a lot of positive feedback from a game I invented last spring I called “Cargo Bike Rocket Jousting”. So I think a promising route to cargo bike acceptance is to promote them as recreational equipment in addition to transportation. What’s cool about cargo bike games is that parent-child pairs can work together to play cargo bike games, each with a valid role. And then they can bike home together. I’ve traveled to over 40 countries and I can honestly say there is no place I’d rather live than in Ithaca. The more you see about the magic that this place holds, the more you understand why we stay here. Electric-fatbike.com also interviewed Larry for about 15 minutes about the games and the youtube photo slideshow file can be watched right here. I can’t stand to listen to my own voice so have a listen and tell me how great it was. He does talk a lot about his daughter crying a team together and the terrible indifference that the normal public school system seems to have toward anything remotely interesting. 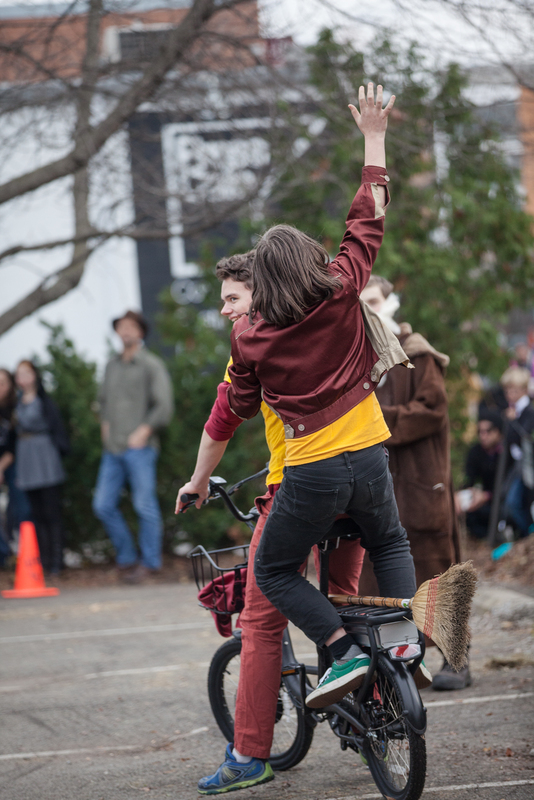 Cargo Bike Quidditch is something that can make everyone feel young again and it really emphasizes the most important feature of all ebikes. Ride On Wizards, Ride On. and nyc is seizing ebikes and fining ebikers.